For leather cord, rubber cord or suede lace jewelry, you will be using a little bit of glue or jewelers cement (like E6000) , and a tab endcap to hold the ends. Gather your components and glue. 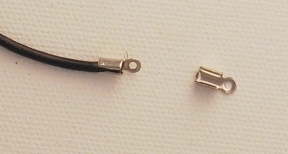 Place a small drop of glue on the end of the cord. Carefully place the cord into the endcap channel. Leave a little space at the end so you can attach your ring and chain (don't overlap the hole). Using your flat or chain nose jewelry pliers (not a crimping tool), simply squeeze down the tabs of the folds on the endcap so that they are securely holding the cord into place. Repeat these steps on the other end of your piece. 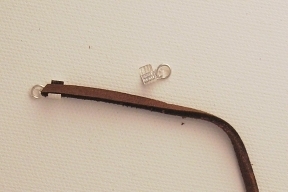 TIP - It is recommended that you hold this in place with your pliers for at least 30 seconds to a minute to allow the glue to take hold and dry a little bit for an extra secure finish. Let the necklace or bracelet dry for a day before wearing it so you don't pull out your ends! That's it! Now you can attach a split ring or other finding to the endcaps and then attach an extender chain or clasp to your piece, and your jewelry is ready to wear!